The Bell 206B JetRanger III is a 5-seat light utility helicopter powered by a single Rolls Royce Allison 250-C20J turbine engine. In 1961, twelve companies submitted proposals to meet U.S.Army requirements for a four-seat turbine-powered light observation helicopter. After evaluation, three designs were selected and 5 of each: the Bell OH-4A; the Hiller OH-5 and the Hughes OH-6, were ordered for trials by the U.S.Army Aviation Board. The prototype of this Model 206 made its first flight on 8 December 1962. However the Bell OH-4A didn't win the competition, the helicopter was a success as the Bell 206 Jet Ranger. The prototype of this five-seat commercial model, the Bell 206A JetRanger N8590F, flew on 10 January 1966. Bell received FAA certification for the helicopter on 20 October 1966, and deliveries of the Model 206A powered by a 317 shp Allison C18A engine, started in January 1967. In the early 1970s, production switched to the Model 206B JetRanger II with a 400 shp 250-C20 turboshaft. Next to this commercial success the Jet Ranger entered after all also the military scene: the Bell 206 Jet Ranger was ordered in 1962 by the US Navy as the TH-57 Sea Ranger. Due to the higher unit price and significant deliver delays on the original winner of the 1961 U.S.Army competition for a light observation helicopter, the Hughes OH-6, the U.S. Army reopened in 1968 the light observation helicopter (LOH) bidding. This time Bell was the winner and an initial order for 2200 OH-58A Kiowa, a military version of the Model 206A followed. Deliveries of the OH-58A helicopters began in May 1969. The Model 206 was built under license by Agusta in Italy as the AB.206 Jet Ranger. More than 4800 206Bs and 1700 206Ls have been produced since the introduction of the 206A JetRanger on 13 January 1967, when the first two production aircraft were delivered to customers. Since, Bell has delivered five different generations of the commercial 206 with its 206A/B JetRangers and 206L/L1/L3/L4 LongRangers. Production of the Bell 206B3 JetRanger ended in 2011; production of the Bell 206L4 LongRanger IV ended in June 2017. At the end, the Bell 206 aircraft were produced at Bell Helicopter's facility in Mirabel, Canada. The ICAO Aircraft Type Designator for the Bell 206B helicopters is B06. On 21 June 1989, the Bell 206B JetRanger III c/n 4057 was registered first with Bell Helicopter Textron, Canada, as C-FFNM. On 21 August 1989, registration C-FFNM was cancelled as exported to Belgium in July 1989. On 13 July 1989, the helicopter was registered OO-VCC in Belgium with V.C. Helikopters, Sint-Pieters-Leeuw. 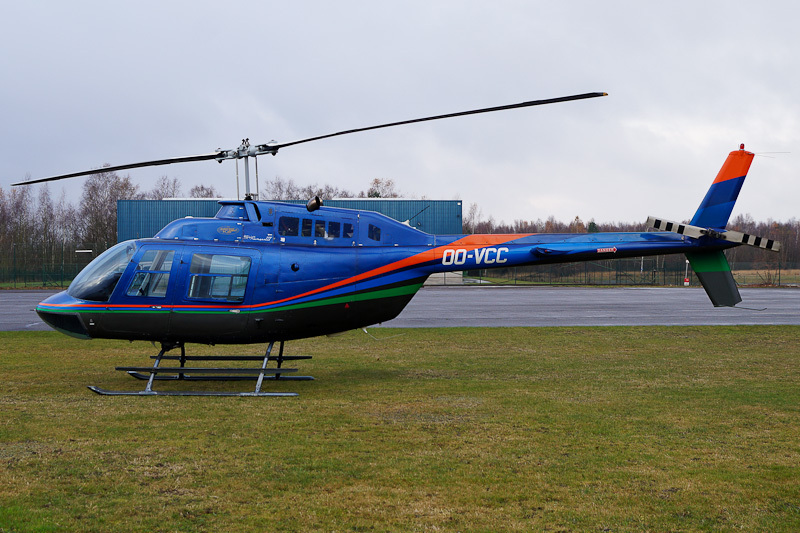 In 1991, registration PH-VCK was reserved for the helicopter by V.C. Helicopters Nederland, Eindhoven. On 17 September 1991, V.C. Helicopters Nederland asked to use registration PH-VCH instead of PH-VCK, but was not allowed. On 19 November 1991, the 1989-built Bell 206B JetRanger III was registered PH-VCK in the Netherlands with V.C. Helicopters Nederland, Eindhoven. On 29 April 1992, registration PH-VCK was cancelled and the helicopter returned to its owner V.C. Helikopters, Belgium. Reservation was made for registration OO-RJL but this was ntu and the helicopter was restored to the Belgian register as OO-VCC with HSB - Heli Service Belgium, Halle, the succesor of V.C. Helikopters. Bell 206B JetRanger III OO-VBA was seen at Genk-Zwartberg airfield on 3 December 2016.